Much is written and spoken nowadays about the death of print and more and more, those hungry for current affairs turn away from traditional newspapers in search of the stories of the moment. There is something reliable abut a newspaper though, a sense of tradition and authority that I cannot help but associate with Sundays and the ever-thicker parcels of paper and supplements that were lugged along the streets by our ever reliable paperboy. 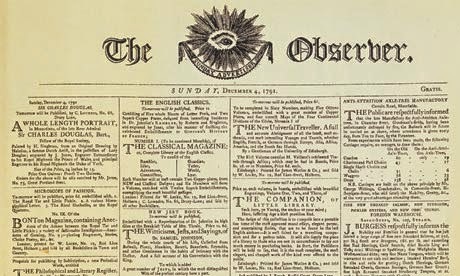 On 4th December 1791, a newspaper was published that remains a weekly staple here in the United Kingdom and is, in fact, the oldest Sunday newspaper in the world. The publication in question is, of course, The Observer. "Unbiased by prejudice – uninfluenced by party. Whole principle is ­independence, whole object is truth, and the dissemination of every species of knowledge that may conduce to the happiness of society." In fact, Bourne's starry eyed dreams of wealth were to prove very wide of the mark and barely three years had passed before he found himself over £1500 in debt, a frightening figure indeed. Dreams of independence were soon set aside and Bourne turned to the government and offered to sell them his newspaper. Although the offer was rejected, it was agreed that the paper would receive a government subside if it abandoned its policy of political impartiality. With the assistance and guidance of his brother, Bourne decided that he had no choice but to accept. Although his credit was saved, Bourne's heart was no longer in the project and in 1807 he gave up his role as editor. Seven years later, Bourne sold the newspaper to William Innell Clement and left the newspaper business for good. Which is why you will very rarely find an unbiased newspaper. Either they are sycophantic to the government, or sponsored by wealthy men who have their own axe to grind, whichever their colour of politics, and indeed whether they fancy themselves as cut from the same cloth as Warwick the Kingmaker.